After the success of the Harry Potter and A Song of Ice and Fire franchises, everyone and their mother thought they could cash in by simply creating their own fantasy series. Talk to anyone over the last fifteen years who has decided they want to write a book, and more often than not one of the following words will be used to describe their work: magic, young adult, wizarding, dragons, fantasy. Imitation may be the sincerest form of flattery, but it’s still imitation: a paint-by-numbers, cookie cutter cloning of the original. What sets things like Harry Potter or A Song of Ice and Fire or Star Wars or any number of other originally created worlds apart is just that – they are original. And what true originality possesses that imitation rarely does is risk. The copycats, no matter how worthy they may be in their own right, don’t possess the magical spark of risk of the originals. There is only so much ore one can mine from the pits of creativity before all you get is rock and dust. 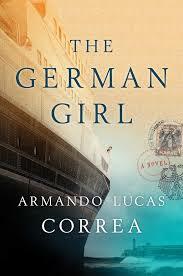 The German Girl is, by the above condition, an important novel, and the author, Armando Lucas Correa, a serious writer. In the debut novel, Hannah Rosenthal is a 12-year-old German Jew who is trying to flee Berlin with her parents in 1939. Anna Rosen is a 12-year-old New York girl who is trying to learn about the fate of her family in present-day New York. We follow Hannah as her family board the ill-fated SS. St. Louis for Cuba. We also follow Anna and her mother who go to Cuba to discover Anna’s family’s roots. The novel starts off promising, utilizing a split narrative similar to All the Light We Cannot See. Correa seems to promise that the two stories will weigh equally and slowly integrate by the end of the novel. Instead, we get two disproportionate stories, one set within a Berlin that is busy resettling their Jewish citizens, a story that on paper could seem harrowing, but is run-of-the-mill; the second narrative is merely a character asking questions about her family’s history. This second story (Anna’s) does not even attempt to be compelling; rather, it is a lot of set-up for the final third of the book, which is set in Cuba. The first story (Hannah’s) is similarly underwhelming. It’s not that Correa does not depict the horrors of what it must have been like living as a Jew in pre-WWII Berlin. It just feels rather old hat. He is not telling us anything new. He is not showing this to us in a new light. He is not opening our eyes to a different perspective. He is not taking a single risk in his writing. In so doing (or, not doing), the author has reduced these horrors to mere cliché. The middle portion of the novel is a quick recounting of the voyage of the SS. St. Louis, the ship carrying over nine-hundred Jewish refugees that was barred from entering Cuba, then turned away from the U.S., before delivering its passengers to several European countries, many of which were later invaded by Germany. Approximately two-hundred and fifty of the passengers died during the Holocaust. If one knows the history of this ship, this portion of the book holds little suspense. If not, it still carries little drama. It’s less interesting than Titanic pre-iceberg. The final third, set in Cuba, merely serves to fill in some blanks and end certain characters’ arc-less narratives. Historical tragedies are readymade tools for creating empathy. It’s hard not to feel for victims and survivors of the Holocaust. The six million killed may be a mere statistic that defies our capacity for understanding; the single victim is the tragedy whose tale must be told. In The German Girl, however, it’s told with little imagination, as if the backdrop of the Holocaust were enough to elicit our sympathies. If this read as memoir (and from what I gather, it may be the byproduct of Correa’s own family history), it would still come across as flat and uninspiring. Little of what Anna learns about her family’s history seems to change her life. Little of Hannah’s story changes the reader’s. This is not to say that Correa’s heart is not in the right place, it’s just that his pen is not up to snuff in creating meaningful characters we actually care about or anything but lackluster prose. Hannah loves her family and is infatuated with her friend Leo. This is all well and good, but her later life is played out as a maudlin pity party. Countless survivors of the Holocaust suffered depression later in life, but simple abject depression without nuance does not a good character make. Anna’s desire to know more about her family is the jumping off point of many far better novels. Here, the knowledge she gains does little to reshape who she is. Furthermore, the general emotion one walks away with after reading The German Girl is not empathy or pathos or catharsis or any of those other feelings one gets from diving deep into the bowels of tragedy. It is maudlin sentimentality. One such example is an early chapter that has the line: “That September day was like any other.” Is there a greater cliché to open a paragraph about 9/11? And is there a more banal, poorly conceived of, and unimaginative one? It’s the Holocaust (or 9/11) by way of Nicholas Sparks. The German Girl perceives historical events as possessing narrow bands of emotion. There is no anger at what happened, no hatred at the perpetrators, no self-doubt or self-guilt; we never see the true horrors of these events, rather we live mostly on the sidelines. The only emotion the author wishes to convey is a passing sadness. It’s the kind of work that makes the reader feel good that they feel bad about an evil that happened a long time ago. It’s a completely risk-averse undertaking. There is a plot thread about the Rosenthal’s trying to pretend they aren’t Jews by changing their name to Rosen (which, is still pretty Jewish, FYI). If this concept of denial of one’s identity had been explored more, this novel may have become more complex than it is. In fact, if any of the half filled-out narratives had been treated as a focal point, The German Girl may have actually succeeded. A story about trying to flee Berlin, told over three or four days could have been both suspenseful and original. One simply about the voyage of the St. Louis is filled with possibilities. Even a novel about a refugee from the tyranny of Nazism living under the tyranny of Castro has more potential than the end result here. The German Girl tries to cram all of these into a novel that is (thankfully) under 400 pages. Each part of the story is diluted so much that the final product is a lightweight story of serious events. Just because you write about an important topic does not make your writing important. The German Girl is a prime example of why heavy topics do not necessarily make good literature. Good literature can come out of nowhere. I’d prefer to pour myself a butterbeer and dive back into Hogwarts than read one more line of unoriginal, maudlin, tearfully “important” fiction.